· Kid Scavenger Hunt – Children can explore the different kid-friendly activities on the show floor and receive stamps on a checklist. Once they receive all of their stamps they can redeem their checklist for a free prize at the Grand Prize Giveaway Booth. · BASSMaster CastingKids - The CastingKids program is easy, fun and makes fishing exciting for kids. Open to young people in two age groups, 7-10 and 11-14, the goals of these competitions are to get America’s youth involved in the sport of fishing and to foster an appreciation and concern for the outdoors. The challenge is to “cast, pitch and flip,” which are very important skills needed in order to catch a fish. Scoring is based on a points system and the young angler with the most points wins. Put down the ice auger and join in on the fun of indoor fishing this January with the return of the Chicagoland Fishing, Travel & Outdoor Expo, January 25-28, at the Schaumburg Convention Center, 1551 North Thoreau Drive. Perfect for both the novice and experienced angler or anyone interested in the outdoors, the annual “Sportfishing Spectacular” offers the latest in fishing and outdoor gear, as well as an extensive lineup of seminars with top-notch local and national fishing professionals, and hands on family activities. This year, anglers will have the opportunity to purchase the latest gear and equipment from top manufacturers and retailers, book their next adventurous getaway and browse the newest state-of-the-art fishing boats on the market. Featuring more than 100 travel-related exhibitors (including guides, lodges, resorts and regional promotion agencies), major fishing tackle manufacturers, local fishing retailers, and a diverse selection of fishing boats and kayaks, attendees will be able to see, learn, touch and buy everything they need for their next fishing or outdoor adventure. Expo attendees will also have the opportunity to learn something new or improve their current skill level with the Chicagoland Fishing, Travel & Outdoor Expo’s impressive lineup of seminars led by expert instructors and nationally recognized fishing celebrities. The Chicagoland Fishing, Travel & Outdoor Expo also features an indoor fly fishing pond for attendees to try their hand at casting or watch trick casting demos. Other highlights of the event include a 5,000-gallon fish tank stocked with bass and pan fish, a virtual fishing experience activity, a birds of prey exhibit, and Chauncey’s Great Outdoors, a family friendly interactive exhibit featuring snakes and reptiles. 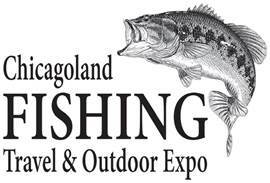 The Chicagoland Fishing, Travel & Outdoor Expo will be open Thursday-Sunday, January 25-28, 2018. Show hours are as follows: 12 - 8 p.m. Thursday, January 25 and Friday, January 26; 10 a.m. –8 p.m. Saturday, January 27; and 10 a.m. – 5 p.m. Sunday, January 18. Tickets can be purchased in advance online and are $12 for adults and $3 for children starting at age six; children 5 years old and younger are free. Click HERE for more information on the Chicagoland Fishing, Travel & Outdoor Expo.